Our expert team of healthcare compliance consultants focus on information security audits. We offer a variety of audits or assessments, along with an actionable plan that you can manage directly in our cloud-based healthcare compliance software. Do you have the time, resources or expertise to complete your own compliance risk assessment? Most healthcare organizations don’t. That’s where ComplyAssistant comes in. Our healthcare compliance consultants use a unique approach that combines state-of-the-art software with seasoned subject matter expertise. We are not your typical consultants! We won’t just leave you with a massive report and no instructions on how to implement recommended changes. With our proprietary software, you’ll have direct access to an actionable plan that helps you manage the process and ultimately improve your overall compliance. Our clients depend on us to help them prepare and protect their organizations from security breaches. Our goal is to be your long-term partner in managing governance and oversight of your compliance program. How do our healthcare compliance consultants work? Because ComplyAssistant is an objective third party, we take an unbiased approach to reviewing your internal controls and processes. We’ll work one-on-one with you to complete professionally-crafted question libraries, developed by our partner attorney. And we provide your organization with suggestions on improving all related policies, procedures and evidence documentation that can be housed directly in our software. What will you get from an engagement with ComplyAssistant? Once audits or assessments are completed by our healthcare compliance consultants, we document each component for risk level, compliance level, current processes and controls, gaps and future plans. We then translate all of this information into follow-up action items. 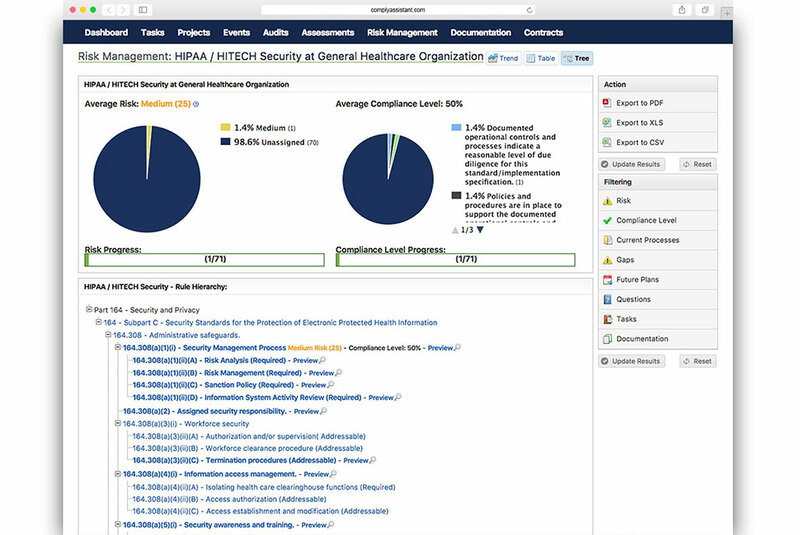 You’ll get an executive summary and a holistic risk mitigation roadmap, housed in our software portal, that you can use to achieve ongoing, efficient risk management and compliance. Our healthcare compliance consultants provide comprehensive and directive recommendations. What you’ll get is a means of improving your compliance through assigned action items in a user-friendly software platform. 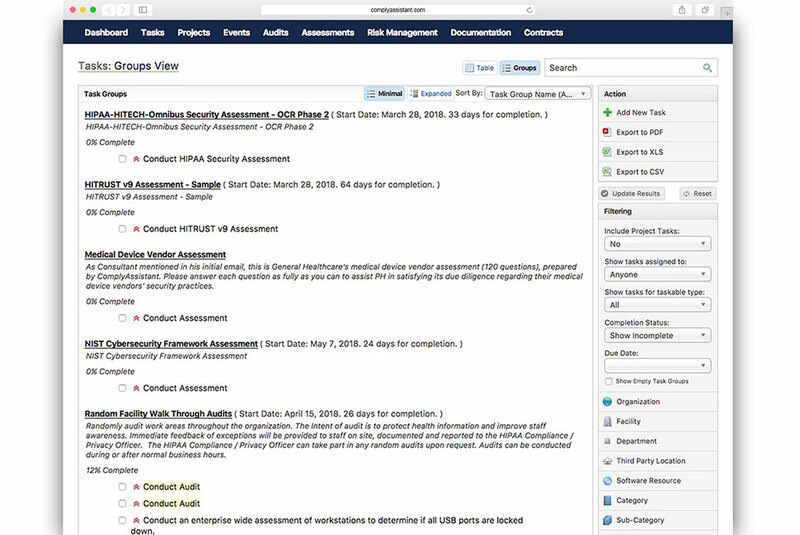 In this example, our clients can interact with their risk mitigation roadmap in our software portal. Stay up to date and on track to achieve ongoing, efficient risk management and compliance. Clients appreciate our holistic approach to healthcare compliance.